Along the lines of the Interstate Highways Traveled page, this page is an attempt to figure out which U.S. Highways I have traveled and when, along with pictures gathered from my larger collection of sign pictures. Figuring out which stretches of these roads I have traveled involves quite a bit of guesswork, especially those travels made before this effort began. Images are in order from north to south or from east to west, as appropriate. This information is also available on the Travel Mapping site in map and tabular form. Near I-95 in Houlton, Maine. Calais, Maine, to Belfast, Maine. US 1A from Ellsworth, Maine, to Brewer, Maine, and Bangor, Maine, to East Hampden, Maine. Around Thomaston, Maine, to Brunswick, Maine. Freeport, Maine, area. Falmouth, Maine, to Portsmouth, New Hampshire. All of US 1A in York, Maine. Seabrook, New Hampshire, to Jct. I-95 near Islington, Massachusetts. Walpole, Massachusetts, to Jct. I-95 in Attleboro, Massachusetts. Providence, Rhode Island, area. Near Allenton, Rhode Island. Westerly, Rhode Island, area. Groton, Connecticut, to New London, Connecticut. East Lyme, Connecticut, to Old Saybrook, Connecticut. East Haven, Connecticut, to West Haven, Connecticut. Downtown New Rochelle, New York. Jct. 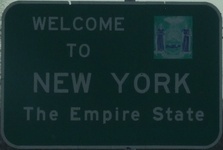 I-95 in Bronx, New York, to Jct. U.S. 46 West in Ridgefield, New Jersey. Jct. NJ 495 to Jct. Holland Tunnel entrance, New Jersey. Truck US1/9 from Jct. NJ 440 to Jct. NJTP. Jct. I-78 in Newark, New Jersey, to Jct. US 9 South in Woodbridge, New Jersey. Jct. I-287 in New Jersey to Jct. I-295, New Jersey. Jct. NJ 29 in Trenton to Jct. US 13 near Morrisville, Pennsylvania. Jct. PA 532 in Philadelphia, Pennsylvania, to Jct. I-695 in Maryland. Baltimore, Maryland, to Jessup, Maryland. Central Washington, D.C. Woodbridge, Virginia, to Jct. I-295 north of Richmond, Virginia. Richmond, Virginia, area. SR 620 to Virginia 144 in Colonial Heights, Virginia. South Hill, Virginia, to North Carolina line. Henderson, North Carolina, to Aberdeen, North Carolina. Jct. 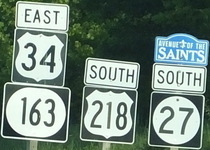 US 220 North in Rockingham, North Carolina, to Jct. US 52 South near Cheraw, South Carolina. North Augusta, South Carolina, to Jct. I-295 in Jacksonville, Florida. Jct. FL9B near Jacksonville, Florida, to Jct. Florida 312 in St. Augustine, Florida. I-95 Exit 298, Florida, to National Gardens, Florida. Daytona Beach, Florida, area. Titusville, Florida, area. Melbourne, Florida, area. White City, Florida, to Stuart, Florida (downtown). Jct. Florida 714 in Stuart, Florida, to Juno Beach, Florida. Jct. Florida 84 in Fort Lauderdale to Jct. Florida 856 in Hallandale Beach, Florida. Jct. MacArthur Causeway in Miami, Florida, to southern terminus at Key West, Florida. Clinched in Georgia (well, previously was, now missing new Oak Park bypass). Old Town, Maine, to Bangor, Maine. Bethel, Maine, area. St. Johnsbury, Vermont, to Montpelier, Vermont, including all of Business US 2 in Montpelier. Waterbury, Vermont, area. Tafts Corner, Vermont, to Burlington, Vermont. Jct. I-89 near Checkerberry, Vermont, to North Hero, Vermont. Near Lake Champlain Bridge in Vermont to western terminus in Rouses Point, New York. Passed eastern terminus on I-75. Wakefield, Michigan, to Superior, Wisconsin. Multiplex with I-35 near Duluth, Minnesota. Jct. Minnesota 194 west of Duluth to Bemidji, Minnesota. Solway, Minnesota, to East Grand Forks, Minnesota. Grand Forks, North Dakota, area. Multiplex with I-90 in Spokane, Washington. Passed western terminus on I-5. Twin Mountain, New Hampshire, to Jct. I-93 South of Franconia Notch, New Hampshire. Lincoln, New Hampshire, area. Ashland, New Hampshire, area. Concord, New Hampshire, area. 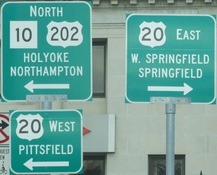 Manchester, New Hampshire, to the southern terminus in Cambridge. Eastern terminus in Portsmouth, New Hampshire, to Concord, New Hampshire through multiplex with I-93 north of Concord. Andover, New Hampshire, to Danbury, New Hampshire. Lebanon, New Hampshire, to southern terminus in East Greenbush, New York. Clinched in Vermont, New York. Coventry, Vermont, to Jct. I-91 in Orleans, Vermont. 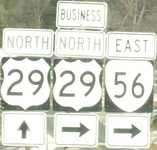 Concurrency with US 302 in Wells River, Vermont. Newbury, Vermont, to Bradford, Vermont. Fairlee, Vermont, to Brattleboro, Vermont. Greenfield, Massachusetts, area. Deerfield, Massachusetts, to Jct. Connecticut 140. 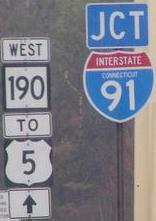 Multiplex with I-91 in Hartford, Connecticut, to North Haven, Connecticut. Eastern terminus in Provincetown, Massachusetts, to Buzzards Bay, Massachusetts. East Swansea, Massachusetts, to Jct. I-384 near Quarryville, Connecticut. Multiplex with I-84 near Hartford Danbury, Connecticut. Bristol, Connecticut, to I-84 multiplex near Thomaston, Connecticut. Multiplex with Connecticut 8. Multiplex with I-84 near Southbury, Connecticut. Multiplex with Connecticut 25 from Newtown to east of Danbury. Multiplex with I-84 near Danbury, Connecticut. Peekskill, New York, to Goshen, New York. Port Jervis, New York, to Jct. I-80 west of Milford, Pennsylvania. Business US 6 in Carbondale, Pennsylvania. Carbondale, Pennsylvania, to Jct. US 11 North near Factoryville, Pennsylvania. Business US 6 from Olyphant to Scranton, Pennsylvania. Tunkhannock, Pennsylvania, area. Multiplex with US 62 in and near Warren, Pennsylvania. Cleveland, Ohio, area. Sandusky, Ohio, to Fremont, Ohio. Multiplex with US 24 near Napoleon, Ohio. Multiplex with I-80 and I-94 near Gary, Indiana, into Illinois. Between I-80 Exits 116 and 105 near Morris, Illinois. Geneseo, Illinois, to concurrency with I-74 in Quad Cities in Illinois and Iowa. Jct. I-80 northwest of Davenport, Iowa, to Moscow, Iowa. Coralville, Iowa, area. Jct. US 63 South to Jct. Iowa 224 near Grinnell, Iowa. Multiplex with I-80 east of Des Moines, Iowa. Jct. I-80 East near De Soto, Iowa, to Jct. Nebraska Link 55K west of Lincoln, Nebraska. Sterling, Colorado to Jct. I-70 in Lakewood, Colorado. All multiplexes with I-70 in Colorado. Also, Loveland Pass near Dillon, Colorado, and Grand Junction area in Colorado. Multiplex with I-70 in westernmost Colorado to Jct. US 93 South in Majors Place, Nevada. Clinched in Rhode Island (probably) and Utah. Jct. I-90 to western terminus at US 20. Burlington, Vermont, to Jct. I-84 West near Danbury, Connecticut. Passed western terminus on I-35. Northern terminus in Champlain, New York, to Poughkeepsie, New York. Cortlandt, New York, to Jct. NY 9A South near Croton-on-Hudson, New York. Yonkers, New York, to Jct. US 46 West in Ridgefield, New Jersey. Jct. NJ 495 to Jct. Holland Tunnel entrance, New Jersey. Truck US1/9 from Jct. NJ 440 to Jct. NJTP. Jct. I-78 in Newark, New Jersey, to Lakewood, New Jersey. Multiplex with Garden State Parkway near Toms River, New Jersey. Garden State Parkway Exit 50 to Jct. A/C Expressway, New Jersey. Multiplex with Delaware 1. 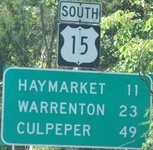 Passed southern/western terminus on US 13 in Delaware. Northern terminus in Albany, New York, to Stony Point, New York, area. Jct. Palisades Interstate Parkway in Alpine, New Jersey, to at or near southern terminus at the George Washington Bridge/Palisades Parkway, New Jersey. Passed eastern terminus on I-75. Multiplex with US 127 near Clare, Michigan. Jct. US 31 North to western "terminus" in Ludington, Michigan. Hastings, Minnesota, to Elk River, Minnesota. Big Lake, Minnesota, to Little Falls, Minnesota. 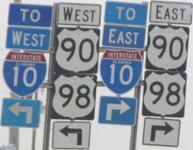 Moorhead, Minnesota, and Fargo, North Dakota, area to western terminus at I-10 in West Fargo, North Dakota. Possibly clinched in North Dakota. Jct. US 2 in Rouses Point, New York, to Jct. 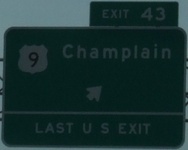 I-87 in Champlain, New York. Malone, New York. Potsdam, New York, area. I-781 at Fort Drum, New York, to Jct. New York 3 in Watertown, New York. Jct. New York 481 to Jct. I-81 Exit 26 in North Syracuse, New York. 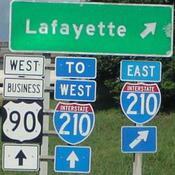 LaFayette, New York, to Jct. 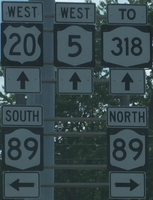 I-81 Exit 12 in Homer, New York. Multiplex with New York 13 in Cortland, New York. Jct. New York 12 to Jct. I-81 Exit 6A in Chenango Bridge, New York. Jct. I-81 Exit 5 to Jct. I-81 Exit 3 in Binghamton, New York. Jct. I-81 Exit 2W Near Binghamton, New York, to Forty Fort, Pennsylvania. Northumberland, Pennsylvania, to Camp Hill, Pennsylvania. I-81 Exit 3 in Pennsylvania to Jct. US 40 in Hagerstown, Maryland. Harrisonburg, Virginia, area. Staunton, Virginia, area. Salem, Virginia, area. Radford, Virginia, to Dublin, Virginia. Multiplex with I-81 in southwestern Virginia. Abingdon, Virginia, area. Jct. 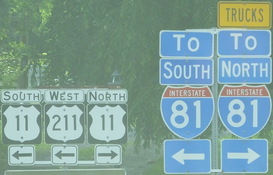 I-81 Exit 5 to US 11E/W split in Bristol, Virginia. 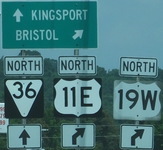 US 11W from Bristol, Tennessee, to Kingsport, Tennessee. 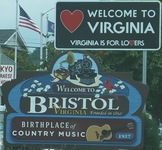 US 11E from Bristol, Virginia, to Johnson City, Tennessee. Knoxville, Tennessee, downtown area. Multiplex with I-75 northeast of Chattanooga, Tennessee. Jct. I-24 to Jct. Tennessee 148 in Chattanooga, Tennessee. Multiplex with I-20/I-59 from exits 106 to 108 in Bessemer, Alabama. Multiplex with I-20/I-59 in Meridian, Mississippi. Eastern terminus in Detroit to Inkster, Michigan. Jct. Old Michigan 205 to Jct. I-94 Exit 4 in Michigan. Jct. I-90 to Jct. US 151 North near Madison, Wisconsin. Multiplex with Wisconsin 29 near Elk Mount, Wisconsin. Menominee, Wisconsin, to Roberts, Wisconsin. Multiplex with I-94 near Wisconsin-Minnesota border to Minneapolis, Minnesota. Multiplex with I-94 from Miles City to Forsyth, Montana. Multiplex with I-90 from Garrison to Missoula, Montana. Jct. I-82 in Richland, Washington, to Jct. Washington 123. Multiplex with I-5 in Washington. Elma, Washington, to western terminus in Aberdeen, Washington. 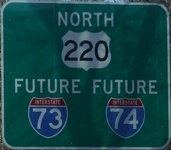 Northern terminus at US 1 to I-276 in Pennsylvania. Along Roosevelt Blvd. in Philadelphia, Pennsylvania. Jct. I-295 near Wilmington, Delaware, to Norfolk, Virginia. Multiplex with US 64 in Virginia. Multiplex with US 70 near Goldsboro, North Carolina. Passed eastern terminus at US 41 in Chicago, Illinois. Multiplex with US 151 near Madison, Wisconsin. LaCrescent, Minnesota, to Goodview, Minnesota. Multiplex with US 52 in Rochester, Minnesota. Multiplexes with I-35 and US 218 near Owatonna, Minnesota. Wall, South Dakota, to Gillette, Wyoming. Sheridan, Wyoming, to Burgess Junction, Wyoming. Cody, Wyoming, to western terminus at the east entrance to Yellowstone National Park or within the park, if US 14 really enters. Eastern segment: Deadwood and Lead, South Dakota, area. 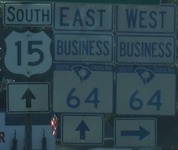 Western segment: eastern terminus at Burgess Junction, Wyoming, to western terminus at Cody, Wyoming. 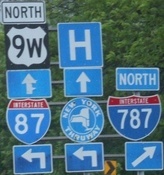 Passed northern terminus on I-86 in Corning, New York. Williamsport, Pennsylvania, area. Shamokin Dam, Pennsylvania, to Farmville, Virginia. Keysville, Virginia, to Wyliesburg, Virginia. Multiplex with I-85 near Durham, North Carolina, to near Lemon Springs, North Carolina. Near Southern Pines, North Carolina, to Laurinburg, North Carolina. Multiplex with US 52 near Society Hill, South Carolina. Jct. I-20 to Sumter, South Carolina, area. Multiplex with I-95 and US 301 in South Carolina. Jct. US 178 near Harleyville, South Carolina, to southern terminus. Eastern terminus in Rapid City, South Dakota, to Gillette, Wyoming. Buffalo, Wyoming, to western terminus at the eastern entrance to Yellowstone National Park or inside the park. Multiplex with I-66 in Virginia. Old Tavern, Virginia, to Jct. 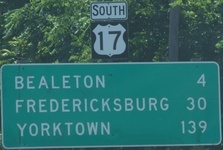 US 1 South near Fredericksburg, Virginia. Part of Business US 17 in Warrenton, Virginia, concurrent with US 211. Business US 17 in Fredericksburg, Virginia, from US 17 North to US 1 South. Portsmouth, Virginia, to Elizabeth City, North Carolina. Multiplex with US64 in North Carolina. Jct. 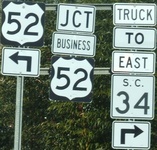 US 258 near Jacksonville, North Carolina, to Jct. Bus. US 17 north of Myrtle Beach, South Carolina. Alt. 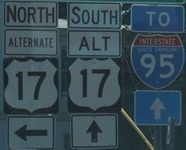 US 17 from U.S. 15 to southern terminus in South Carolina. Jct. US 501 in Myrtle Beach, South Carolina to Jacksonville, Florida (at Airport Rd). Orange Park, Florida, to Lake Mary, Florida. Kissimmee, Florida, to southern terminus in Punta Gorda, Florida. Milwaukee, Wisconsin, area, at least on foot. Madison, Wisconsin, to Dodgeville, Wisconsin. Multiplex with US 218 in Iowa. Multiplex with I-35 in Iowa. Multiplex with I-29 in South Dakota. Pittsburgh, Pennsylvania, area. Multiplex with I-79 in West Virginia. Princeton/Bluefield, West Virginia, area to Jct. Virginia 80 South. Jct. 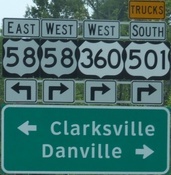 I-81 Exit 5 in Virginia to US 19 E/W split in Bluff City, Tennessee. US 19W from northern US 19 Jct. through US19W multiplex with I-26 in Tennessee. US 19 multiplex with I-26 in North Carolina. Cherokee, North Carolina, to Almond, North Carolina. Jct. 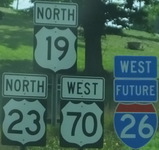 US 129 North near Topton, North Carolina, to Ranger, North Carolina, except Murphy bypass. Short multiplex with I-285 in Sandy Springs, Georgia. Atlanta, Georgia, area? Albany, Georgia, to Camilla, Georgia. Thomasville, Georgia, to Weekie Wachee, Florida. New Port Richey, Florida, to Dunedin, Florida. Clearwater, Florida, to St. Petersburg, Florida. Multiplex with I-275 in Florida to southern terminus in Memphis, Florida. Eastern terminus in Boston, Massachusetts, to Avon, New York. Angola, New York, to Jct. New York 60 near Fredonia, New York. Brocton, New York, to Westfield, New York. 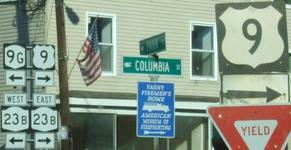 Fairview, Pennsylvania, to Jct. US 6N in West Springfield, Pennsylvania. Mentor, Ohio, area. Cleveland, Ohio, area, to Elyria, Ohio. Near LaPorte, Ohio, to Jct. I-75 in Perrysburg, Ohio (with a small piece of the Fremont bypass missing between US 6 and the eastern junction back with US 20). Near I-80/90 Exit in Toledo, Ohio. Jct. Ohio 49 to Waterford, Indiana, area. (Also Business US 20 from Elkhart to Mishawaka.) Multiplex with I-290 near Elmhurst, Illinois. Multiplex with I-39 near Rockford, Illinois. 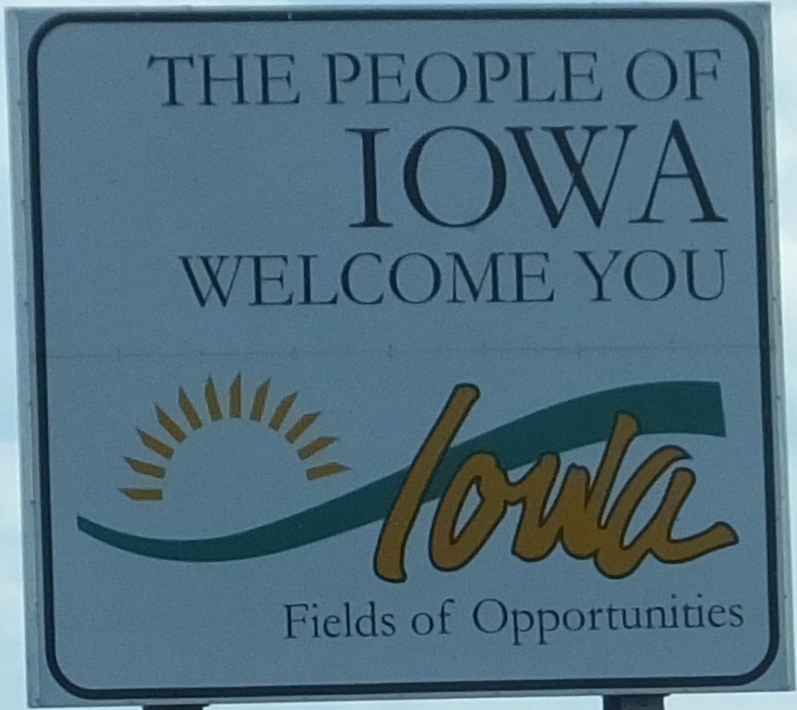 Dubuque, Iowa, to Dyersville, Iowa. Multiplex with I-380 near Waterloo, Iowa. Jct. US 75 North near Sioux City, Iowa, to multiplex with I-129 in Sioux City, Iowa, and South Sioux City, Nebraska. Shoshoni, Wyoming, to east entrance to Yellowstone National Park, Wyoming. All inside Yellowstone, if it is part of US 20. West entrance to Yellowstone National Park, to Idaho border. Multiplex with I-84 in Idaho. Multiplex with US 97 in Bend, Oregon. Corvallis, Oregon, to western terminus at Newport, Oregon. Multiplexes with I-77 in North Carolina. I-77 to I-40 north of Statesville, North Carolina. Multiplex with I-77 in Charlotte, North Carolina, area. Jct. Alt US 17 North to multiplex with US 17 in South Carolina. Multiplex with I-78 in New Jersey to Hamlin, Pennsylvania. Harper Tavern, Pennsylvania, to Skyline View, Pennsylvania. Paxtonia, Pennsylvania, area. Linglestown, Pennsylvania, area. Jct I-81 to Jct. Pennsylvania 225. Monroeville, Pennsylvania, to Gayly, Pennsylvania. Vicinity of western terminus in Cincinnati, Ohio. Passed northern terminus on I-75 in Mackinaw City, Michigan. Standish, Michigan, to Jct. US 20 East near Woodville, Ohio. Multiplex with US 30 near Upper Sandusky, Ohio. Columbus, Ohio, area? 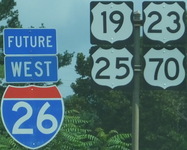 Multiplex with I-26 in Tennessee. Multiplex with I-26 in North Carolina. Dillard, Georgia, to multiplex with I-985 in Georgia. Eagles Landing, Georgia, to McDonough, Georgia. Multiplex with US 129 in Macon, Georgia. Jct. US 1 north of Alma, Georgia, to Jct. I-295 near Jacksonville, Florida. Dearborn/Taylor, Michigan, area to Jct. I-75 in Toledo, Ohio. Jct. I-475 in Perrysburg, Ohio, to Logansport, Indiana. Kentland, Indiana, to Chenoa, Illinois. Multiplex with US 61 in eastern Missouri. Multiplex with US 36 in eastern Missouri. Multiplex with US 65 in central Missouri. Jct. Missouri 291 to Jct. I-435 in Independence, Missuori. Multiplex with I-70 in Kansas City, Missouri/Kansas. Multiplexes with I-70 in western Kansas and eastern Colorado. Multiplex with I-25 in Colorado Springs, Colorado. Granite, Colorado, to Leadville, Colorado. Covington, Kentucky, area. Lexington, Kentucky, area. US 25W multiplexes with I-75, I-40, and I-640 in Tennessee. Multiplex with I-26 in North Carolina. Asheville, North Carolina, area. Mountain Home, North Carolina, to Jct. I-185 in Greenville, South Carolina. Augusta, Georgia, area. North of Statesboro, Georgia, to Jesup, Georgia, including Statesboro Bypass. Near I-95 Exit in Brunswick. 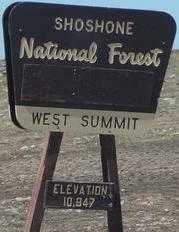 Shoshoni, Wyoming, to Alpine, Wyoming. Multiplex with I-84 in Idaho. Madras, Oregon, to Government Camp, Oregon. Portland, Oregon, area. Former US 27 in Gaylord, Michigan, area. Former US 27 through central Michigan. Multiplex with I-69 near Fort Wayne, Indiana. Cincinnati, Ohio, area? Multiplex with I-24 in Chattanooga, Tennessee. 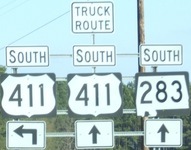 Multiplex with US 411 in northwestern Georgia. Columbus, Georgia, to Cusseta, Georgia. Bainbridge, Georgia, area. Capps, Florida, to Perry, Florida. Alt. 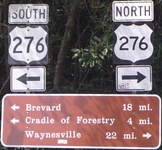 US 27 from Perry, Florida, to Chiefland, Florida. Ocala, Florida, area, to Jct. Florida's Turnpike south of Leesburg, Florida. Jct. I-4 in Florida, to Frostproof, Florida. 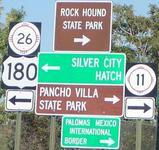 Avon Park, Florida, to Palmdale, Florida. Moore Haven, Florida, to South Bay, Florida. Jct. I-75 in Weston, Florida, to Jct. Florida 826. Jct. Florida 948 to Jct. Florida 933. I-70 in Maryland to Silver Spring, Maryland. Northern fringe of Washington, DC, to Glebe St. in Arlington, Virginia. Jct. Virginia 7 in Falls Church, Virginia, to Jct. Virginia 243 in Vienna, Virginia. New Baltimore, Virginia, to Greensboro, North Carolina. 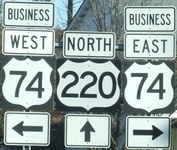 Business US 29 in Warrenton, Virginia, from US 17 North to US 211 West. Multiplex with I-85 in North Carolina. Jct. SC 291 to Jct. SC 20 in Greenville, South Carolina. Multiplex with I-185 and I-85 near Greenville, South Carolina. Athens, Georgia, area? Atlanta, Georgia, area? Alt. US 90 to I-10 near Pensacola, Florida. Eastern terminus in Atlantic City to Jct. Garden State Parkway, New Jersey. Philadelphia, Pennsylvania, area? Bryn Maur, Pennsylvania, to Jct. I-476 in Pennsylvania. Lancaster, Pennsylvania, to York, Pennsylvania. Gettysburg, Pennsylvania, to Breezewood, Pennsylvania. Wilkinsburg, Pennsylvania, to Gayly, Pennsylvania. Jct. I-71 near Mansfield, Ohio, to I-69 Exit 309 near Fort Wayne, Indiana. Schereville, Indiana, to Matteson, Illinois. Jct. Iowa 38 to Jct. US 151 South in Iowa. Fremont, Nebraska, to Grand Island, Nebraska. Jct. I-180 in Cheyenne, Wyoming to west end of multiplex with I-80 between Cheyenne and Laramie, Wyoming. Laramie, Wyoming. Jct. Rte. 789 South in Wyoming, to Rock Springs, Wyoming. Multiplex with US 89 in Idaho. Multiplexes with I-84 in Idaho. Multiplexes with I-84 in eastern Oregon (east of I-82). Multiplexes with I-84 between Hood River and Portland, Oregon. Portland, Oregon, to Burlington, Oregon. Possibly in Astoria, Oregon. Passed northern terminus on I-75. Alanson, Michigan, to Bayshore, Michigan. Bates, Michigan, to Traverse City, Michigan. Honor, Michigan, to Jct. I-94 in Michigan. South Bend, Indiana, area. Multiplex with I-465 in Indianapolis, Indiana, area, and a bit south. Multiplex with I-65 in Clarksville, Indiana. US 31E in downtown Louisville, Kentucky. US 31W from downtown Louisville, Kentucky, to near I-264. Jct. Kentucky 1936 to Fort Knox, Kentucky. City streets in downtown Nashville, Tennessee. Multiplex with I-65 in southernmost Tennessee and northernmost Alabama. Jct. I-20/I-59 in Birmingham, Alabama, to Jct. I-65 in Hoover, Alabama. Alabaster, Alabama, area. Multiplex with I-65 near Smoke Rise, Alabama. Montpelier, Virginia, to Cuckoo, Virginia. Multiplex with US 15 in Virginia. Harrisonburg, Virginia. Multiplex with I-69 and I-469 near Fort Wayne, Indiana. Jct. I-74 in Galesburg, Illinois, to Grand Island, Nebraska. Brush, Colorado, to Greeley, Colorado. Multiplex with I-69 in Indiana. Multiplex with I-70 in Indiana and Ohio. Old U.S. 36 on the west side of Indianapolis, Indiana. Multiplex with I-465 near Indianapolis, Indiana. A block or so west of I-465 near Indianapolis, Indiana. Jct. I-72 west of Decatur, Illinois, to Jct. US 169 in St. Joseph, Missouri. Multiplex with I-72 from Decatur, Illinois, to Jct. I-35 in Cameron, Kansas. Anton, Colorado, to Boulder, Colorado. Jct. Garden State Parkway in New Jersey to Jct. CR 555 near Vineland, New Jersey. Jct. I-295 North in New Jersey to White Marsh, Maryland. Frederick, Maryland, area. Hagerstown, Maryland, area. Multiplexes with I-68 from Cumberland, Maryland, to Keysers Ridge, Maryland. Multiplex with I-70 in West Virginia. Multiplex with I-70 in eastern Ohio. 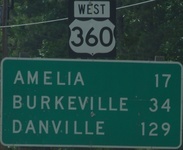 Centerville, Indiana, to Knightstown, Indiana. Old U.S. 40 on the west side of Indianapolis, Indiana. Multiplex with I-465 in Indianapolis, Indiana, area. Jct. Indiana 46 in Robinswood to multiplex with I-70 at Indiana/Illinois line. Vandalia, Illinois, area, to near Greeneville, Illinois. Multiplex with I-70 near Highland, Illinois. Troy, Illinois, to Chesterfield, Missouri. Multiplex with I-70 across Missouri. Multiplex with I-70 in Kansas City area. Multiplex with I-70 across most of Kansas. Multiplex with I-70 in eastern Colorado to Jct. I-70 west of Denver, Colorado. Multiplexes with I-70 in central Colorado. Craig, Colorado, area. Strawberry Reservoir in Utah to western terminus in Park City, Utah. Historic US 40 in Reno, Nevada, and Truckee, California. Northern terminus at Copper Harbor, Michigan, to Harvey, Michigan. Jct. I-43 in Green Bay, Wisconsin, to Jct. US 45 South near Milwaukee, Wisconsin. Multiplexes with I-94 in Wisconsin. Northernmost multiplex with I-94 in Illinois. Jct. 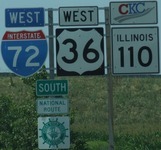 I-94 and I-294 in northern Illinois, to Chicago, Illinois. Multiplex with I-80/94 in Indiana. Kentland, Indiana, to Jct. Indiana 18 near Fowler. Terre Haute, Indiana, area. Multiplex with US 50 in Vincennes, Indiana. Jct. Veterans Pkwy in Evansville, Indiana, to Jct. Audubon Pkwy in Henderson, Kentucky. Downtown streets in Nashville, Tennessee. Jct. I-24 to Jct. Tennessee 148 in Chattanooga, Tennessee. Jct. US 411 South to Kennesaw, Georgia. Georgia 280 in Marietta, Georgia, to I-285 in north Atlanta, Georgia. Atlanta, Georgia, area. Lake Park, Georgia, to I-75 Exit 414, Florida. Jct. Florida 678 to Jct. Florida 579 in Tampa, Florida. Jct. US 92 West in Tampa, Florida, to Venice, Florida. Port Charlotte, Florida, to Jct. Florida 933 in Miami, Florida. Jct. US 1 to southern terminus at Florida A1A in Miami Beach, Florida. (On foot) near northern terminus in Cleveland, Ohio. Brooklyn Heights, Ohio, to Ohio Turnpike onramp near Strongsville. Multiplex with US 224 near Lodi, Ohio, to Jct. US 250 near Ashland, Ohio. Cincinnati, Ohio, and Covington, Kentucky area. Eastern terminus in Plymouth, Massachusetts, to Quarryville, Connecticut. Hartford, Connecticut, to Amenia, New York. Poughkeepsie, New York, area. Passed western terminus in Kerhonkson, New York. Clinched in Massachusetts, Rhode Island. Rockland, Michigan, to Bruce Crossing, Michigan. Multiplex with Wisconsin 29. Jct. US 41 North near Richfield, Wisconsin, through multiplex with I-894 and I-43 in Milwaukee, Wisconsin. Multiplex with US 24 in Gilman, Illinois. Urbana, Illinois, area? Multiplex with US 50 near Flora, Illinois. Tupelo, Mississippi, area. Meridian, Mississippi, to Jct. Alabama 158 north of Mobile, Alabama. Eastern terminus to Jct. NJTP at Exit 18. Jct. Garden State Parkway at Exit 157 to Little Falls, New Jersey. Parsippany-Troy Hills to Jct. I-80 Exit 28. Multiplexes with I-80, plus segment in Netcong. Jct. I-80 near Budd Lake, New Jersey, to western terminus at I-80. Near I-40 in Brinkley, Arkansas. Jackson, Mississippi, to Jct. I-59 north of Hattiesburg, Mississippi. Jct. US 98 south of Hattiesburg, Mississippi, to southern terminus in Gulfport, Mississippi. Eastern terminus in Ocean City, Maryland, to Jct. Virginia 7 in Falls Church, Virginia. Chantilly, Virginia, to Jct. 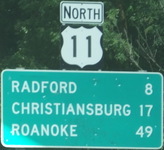 US 15, Virginia. Cincinnati, Ohio, area. Greendale, Indiana, to just east of Vincennes, Indiana. Just east of Bridgeport, Illinois, to Mehlville, Missouri. Multiplex with I-44 in the St. Louis, Missouri, area, to Emporia, Kansas. Dodge City, Kansas, to Jct. US 6/191 near Green River, Utah. Multiplex with I-15 in Utah. Concurrency with US 6 from Delta, Utah, to Majors Place, Nevada. Multiplex with U.S. 95 in Fallon, Nevada. Carson City, Nevada, to Jct. California 89 South near South Lake Tahoe, California. Clinched in District of Columbia, Colorado. Passed northern terminus in Hurley, Wisconsin. Multiplex with Wisconsin 29 near Wausau, Wisconsin. Jct. Wisconsin 30 to Jct. US 12 in Madison, Wisconsin. Multiplex with I-90 in southern Wisconsin. Multiplex with I-90 in northern Illinois, to Jct. I-88 in Illinois. Jct. I-80 to Cedar Point, Illinois. Multiplex with I-72 near Decatur, Illinois. Near exit on I-70 in Vandalia, Illinois. Part of Business US 51 in Bloomington, Illinois. Multiplex with US 50 in Illinois. Multiplex with I-57 in southern Illinois. Multiplex with I-20 and I-55 in Jackson, Mississippi. Multiplex with I-55 in Louisiana. Multiplex with I-94 in North Dakota and Minnesota. South St. Paul, Minnesota, to Burr Oak, Iowa. Dubuque, Iowa. Jct. Sagamore Parkway in West Lafayette, Indiana, to Fowler, Indiana. Jct. US 41 South to Sheldon, Illinois. Multiplex with I-65 in Indiana. Multiplex with I-465 around Indianapolis. Multiplex with I-74 and I-275 in the Cincinnati area. Multiplex with I-64 in West Virginia. Possibly some of the Bluefield, West Virginia, area. Multiplex with I-77 in Virginia. Multiplex with I-77 and I-81 in Virginia. Multiplex with I-85 in North Carolina. Jct. US 1 North near Cheraw, South Carolina, to Jct. US 76 in Florence, South Carolina. Possibly in Charleston, South Carolina. Near northern terminus in International Falls, Minnesota, to near Duluth, Minnesota. Duluth, Minnesota, to Wentworth, Wisconsin. Multiplex with Wisconsin 29 near Chippewa Falls, Wisconsin. Multiplex with I-90 near LaCrosse, Wisconsin. Eastborough, Kansas, to Mullinville, Kansas. Tucumcari, New Mexico, to Vaughn, New Mexico. Carrizozo, New Mexico, to Alamogordo, New Mexico. Multiplex with I-35 from Exit 229 to Jct. I-435, Kansas. Passed western terminus in Springer, New Mexico. Passed eastern terminus in Virginia Beach, Virginia. Jct. 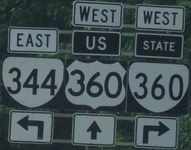 US 301 in Emporia, Virginia, to Lawrence, Virginia. Near South Hill, Virginia. Near South Boston, Virginia. Possibly in Danville, Virginia, area. Multiplex with US 220 near Martinsburg, Virginia. Multiplex with I-81 near Bristol, Virginia. Multiplex with I-94 in Minnesota. Jct. I-90 to Jct. Minnesota 60 West near Worthington, Minnesota. Multiplex with US 6 near Oakland, Iowa. Multiplexes with I-29 in Missouri, plus Exit 53 to Jct. I-29 BL South in St. Joseph, Missouri. Lawrence, Kansas, area. Multiplex with I-35 near Ottawa, Kansas. Sallisaw, Oklahoma, area. Multiplex with I-30 near Texarkana, Texas. Jefferson, Texas, to Jct. Loop 390 north of Marshall, Texas. Near I-20 in Marshall, Texas. Houston, Texas, to Victoria, Texas. Jct. I-35 to southern terminus in Laredo, Texas. Eastern terminus to Jct. US 13 in Virginia Beach, Virginia. Richmond, Virginia, to Buckingham, Virginia. Near Buena Vista and Lexington, Virginia. Multiplexes with I-64 in western Virginia. Covington, Virginia, area. Multiplex with I-64 in eastern West Virginia. Multiplex with US 25 in Lexington, Kentucky. Downtown Louisville, Kentucky, to I-264. Kentucky 1936 near Louisville to Jct. Audubon Parkway near Owensboro, Kentucky. Near US 41 in Henderson, Kentucky. Amarillo, Texas, area. Texico, New Mexico, to Quemado, New Mexico. Multiplex with US 180 and US 191 in Springerville, Arizona. Phoenix, Arizona, area. Passed northern terminus on I-35 in Minnesota. St. Paul, Minnesota, to Red Wing, Minnesota. Wabasha, Minnesota, to LaCrescent, Minnesota. Concurrencies with I-80 and I-280 in Davenport, Iowa. North side of Musactine, Iowa, to Arnold, Missouri. Festus, Missouri, to St. Mary, Missouri. Fruitland, Missouri, area. New Madrid, Missouri, area. All multiplexes with I-55 in southeastern Missouri. Multiplexes with I-55 and I-40 in eastern Arkansas. Rolling Fork, Mississippi, to Baton Rouge, Louisiana. Kenner, Louisiana, to New Orleans, Louisiana. Eastern terminus and nearby areas in Niagara Falls, New York. Near I-290 to Jct. New York 324 in Amherst, New York. Jct. New York 263 to Jct. New York 5 in Eggertsville, New York. Frewsburg, New York, to Franklin, Pennsylvania. New Madrid, Missouri, area. Multiplex with I-49 in northwest Arkansas. Multiplex with I-40 in Oklahoma. Multiplex with I-35 near Oklahoma City, Oklahoma. Multiplexes with I-44 south of Oklahoma City to Lawton, Oklahoma. Carlsbad, New Mexico, to western terminus in El Paso, Texas. Passed northern terminus on US 2 in Benoit, Wisconsin. Multiplex with US 12 in Baldwin, Wisconsin. Hager City, Wisconsin, to Red Wing, Minnesota. Jct. US 6 West to Jct. I-80 in Iowa. Multiplex with US 34 in Ottumwa, Iowa. Multiplex with US 50 in Missouri. Multiplex with I-55 and I-40 in eastern Arkansas. 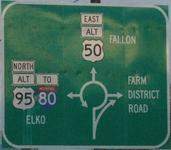 Eastern terminus at Whalebone Junction, North Carolina, to Pittsboro, North Carolina (though some sections have been bypassed since a 1999 ride in eatstern NC). Pisgah Forest, North Carolina, to Highlands, North Carolina. Murphy, North Carolina, to Ranger, North Carolina. Multiplex with I-75 northeast of Chattanooga, Tennessee. Jct. I-24 to Jct. Tennessee 148 in Chattanooga, Tennessee. Multiplex with I-24 in Tennessee. Multiplex with I-55 in eastern Arkansas. Sallisaw, Oklahoma, area. Multiplex with I-25 in northern New Mexico. Taos, New Mexico, to Tres Piedras, New Mexico. Tierra Amarilla, New Mexico, to western terminus at Teec Nos Pos, Arizona. Multiplex with I-80 near Altoona, Iowa, to Jct. Iowa 5 West south of Des Moines, Iowa. Multiplex with US 34 in Lucas, Iowa. Chilicothe, Missouri, to Marshall Junction, Missouri. Part of Business US 65 in Marshall, Missouri. Multiplexes with I-40 and I-30 near Little Rock, Arkansas. 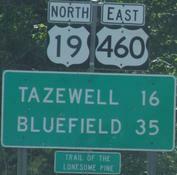 Fairview, Arkansas, to Tallulah, Louisiana. Chicago, Illinois, area. Springfield, Illinois. 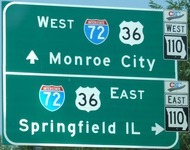 Multiplexes with I-55 between Springfield, Illinois, and Hamel, Illinois. I-270 and Chain of Rocks Road in Mitchell, Illiois. I-270 in St. Louis area. Missouri 366 in St. Louis area. Missouri 100 from Webster Groves, Missouri, to Ellisville, Missouri. Multiplexes with I-44 throughout Missouri. Lebanon, Missouri. Joplin, Missouri, to Miami, Oklahoma. Oklahoma City, Oklahoma, to El Reno, Oklahoma. Elk City, Oklahoma. All multiplexes with I-40 in western Oklahoma. All multiplexes with I-40 in Texas. Shamrock, Texas. Amarillo, Texas, area. Vega, Texas. All multiplexes with I-40 in New Mexico. Tucumcari, New Mexico. Santa Rosa, New Mexico. Santa Fe, New Mexico. Moriarty, New Mexico. Tijeras, New Mexico, through Albuquerque, New Mexico. Grants, New Mexico. Gallup, New Mexico. All multiplexes with I-40 in Arizona. Holbrook, Arizona. Winslow, Arizona. Winona, Arizona. Flagstaff, Arizona. Seligman, Arizona, to Kingman, Arizona. Barstow, California. All multiplexes with I-15 in California. Los Angeles, California, area. Rock Island, Illinois, to Milan, Illinois. Multiplex with US 34 in Monmouth, Illinois. Alton, Illinois, to Jct. I-44 near St. Louis, Missouri. Most of Lindbergh Ave in St. Louis, Missouri, area to Arnold, Missouri. Sappington, Missouri, area. Festus, Missouri, area. Multiplexes with I-40 and I-30 in the Little Rock, Arkansas, area. Multiplexes with I-30 and I-35E in Texas, to Jct. I-20 in Dallas. Multiplexes with I-10 around Fort Stockton, Texas. Multiplex with I-35 in Liberty, Missouri. Multiplex with I-635 near Kansas City, Missouri. Kansas City, Kansas, area. Alt. 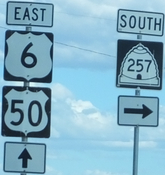 US 69 from Riverton, Kansas, to Picher, Oklahoma. Miami, Oklahoma, area. Beaumont, Texas, to southern terminus in Port Arthur, Texas. Jct. US 258 East near Kinston, North Carolina, to Jct. I-795 near Goldsboro, North Carolina. Jct. I-40 East east of Raleigh, North Carolina, to Brier Creek Pkwy near Raleigh, North Carolina. Multiplexes with I-40 and I-85 in North Carolina. Greensboro, North Carolina, area. Asheville, North Carolina, to Weaverville, North Carolina. Knoxville, Tennessee, downtown area. Charlotte Ave. in Nashville, Tennessee. Multiplex with I-55 near Memphis, Tennessee/Arkansas. Little Rock, Arkansas, to Hot Springs, Arkansas. Jct. US 271 South to Jct. Indian Nation Turnpike near Hugo, Oklahoma. Multiplex with US 287 in Texas. Oklaunion, Texas, to Vernon, Texas. Muleshoe, Texas, to Clovis, New Mexico. Roswell, New Mexico, area. Tularosa, New Mexico, to Las Cruces, New Mexico. West of Las Cruces, New Mexico, to Lordsburg, New Mexico. International Falls, Minnesota, to Big Falls, Minnesota. Bemidji, Minnesota, to Lake Itasca, Minnesota. Multiplex with Minnesota 60 near Windom, Minnesota. Multiplex with US 6 near Atlantic, Iowa. Multiplex with I-29 and I-35 in Missouri. Multiplex with I-49 in Missouri through multiplex with I-49 in northwestern Arkansas. Multiplex with I-40 in Arkansas. Multiplex with I-20 in Louisiana. Jct. I-24 to Jct. Tennessee 148 in Chattanooga, Tennessee. Jct. I-24 in Kimball, Tennessee, to Mt. Carmel, Alabama. Alt. U.S. 72 from Huntsville, Alabama, to Mooresville, Alabama. Eastern terminus in Wrightsville Beach, North Carolina, to Jct. US 17 South near Wilmington, North Carolina. Near Lauringburg, North Carolina. Multiplex with I-85 in North Carolina. E. Flat Rock, North Carolina, to Clyde, North Carolina. Alt. US 74 in Asheville, North Carolina, area. Jct. 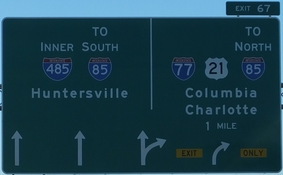 US 221 to concurrency with I-85 in North Carolina. Bryson City, North Carolina, to Almond, North Carolina. Jct. 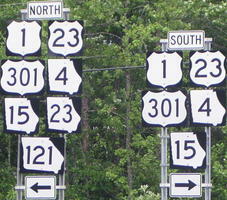 US 129 North near Topton, North Carolina, to Ranger, North Carolina, except for Murphy bypass. Multiplex with I-75 in Chattanooga, Tennessee, area. Multiplex with US 2 in Crookston, Minnesota. Jct. 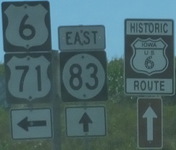 Iowa 60 in LeMars, Iowa, to multiplex with I-129 in Sioux City, Iowa, and South Sioux City, Nebraska. Jct. I-480 East to Nebraska City, Nebraska. Business US 75 in Nebraska City, Nebraska. Multiplex with I-70 in Topeka, Kansas. Multiplex with I-40 near Henryetta, Oklahoma. Dallas, Texas, area. Eastern terminus in Wrightsville Beach, North Carolina, to Jct. US 74 West in Wrightsville, North Carolina. Jct. US 74 East in Wilmington, North Carolina, to Jct. US 17 South near Wilmington, North Carolina. Pee Dee, South Carolina, to Jct. I-95, South Carolina. Sumter, South Carolina, area. Multiplex with US23/441 in Georgia. Mineral Bluff, Georgia, to East Ellijay, Georgia. 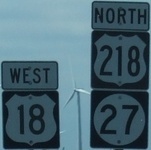 Northern terminus at I-29 in Sioux City, Iowa, to South Sioux City, Nebraska. Near US 30 and US 275 in Fremont, Nebraska. Multiplex with I-80 in Lincoln, Nebraska (if it was multiplexed in 1977). Multiplex with I-35 north of Oklahoma City. John Kilpatrick Tpke. north of Oklahoma City to north of Norman, Oklahoma. Norman, Oklahoma, area. Multiplex with Oklahoma 7 in Davis. Multiplexes with I-35 and I-35E north of Dallas area. Multiplexes with I-35 in central Texas. Victoria, Texas, to University Blvd. in Brownsville, Texas. All of Business US 77 in Brownsville, Texas. Near I-95 in South Carolina. North Augusta, South Carolina, to Augusta, Georgia. Stone Mountain, Georgia, to North Decatur, Georgia. Multiplex with I-20 near Pell City, Alabama. Birmingham, Alabama, to Jct. I-240 near Memphis, Tenneseee. Buffalo, Texas, area. Dell Diamond to western terminus in Round Rock, Texas. Multiplex with I-55 near Memphis, Tennessee/Arkansas. Eastern terminus in Tybee Island, Georgia, to Jct. US 25 Bypass in Statesboro, Georgia. Jct I-185 near Columbus, Georgia, to Jct. 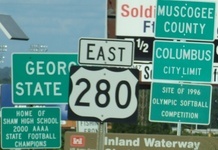 US 280 East in Phenix City, Alabama. Jct. US 231 South to Jct. I-65 in Montgomery, Alabama. Multiplexes with I-20 between Meridian, Mississippi, and Louisiana. Multiplex with I-20 near Waksom, Texas, to Jct. Loop 390 east of Marshall, Texas. Multiplex with I-29 from Pembina, North Dakota, to Joliette, North Dakota. Multiplex with I-29 from north of Grand Forks, North Dakota, to Fargo, North Dakota. 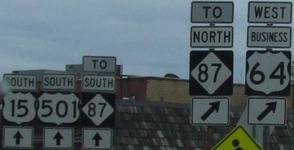 Parts of BR US 81 in Fargo, North Dakota. Multiplex with US 30 in Columbus, Nebraska. Multiplex with US 34 in York, Nebraska. Bowie, Texas, to southern terminus in Fort Worth, Texas. Eastern terminus at I-95 to Jct. Georgia 99. Waycross, Georgia, area. Tifton, Georgia, to Prattville, Alabama, except a short stretch near Albany. Greenville, Mississippi, to Jct. US 65 South in southeastern Arkansas. Henryetta, Texas, to Wichita Falls, Texas. Bismarck, North Dakota, to Sterling, North Dakota. Vivian, South Dakota, to Murdo, South Dakota. Garden City, Kansas, area? Multiplex with US 271 on Loop 286 around Paris, Texas. Multiplex with I-10 near Junction, Texas. Jct. I-35 North of Laredo, Texas, to University Blvd. in Brownsville, Texas. Ludowici, Georgia, to Jesup, Georgia. Waycross, Georgia, area. Thomasville, Georgia, to Dothan, Alabama. Washington, Mississippi, to Vidalia, Louisiana. Abilene, Texas, to west of Santa Rosa, New Mexico. Las Vegas, New Mexico, to western terminus in Pagosa Springs, Colorado. Spearfish, South Dakota, to Lead, South Dakota. Jct. Wyoming 585 to Newcastle, Wyoming. Cheyenne, Wyoming. Greeley, Colorado, to Jct. Colorado 470 near Littleton, Colorado. All multiplexes with I-25 south of Denver, Colorado. Unsigned multiplex with I-25 and I-10 through New Mexico. Multiplex with I-10 in Texas. El Paso, Texas, area, including southern terminus. Multiplexes with I-90 from Billings, Montana, to Buffalo, Wyoming. Multiplexes with I-25 south of Cheyenne, Wyoming, through Colorado to Raton, New Mexico. Amarillo Blvd. in Amarillo, Texas, to first exit on I-27 south. Lubbock, Texas, area. Multiplexes with I-10 near San Antonio, Texas. Livingston, Montana, to Brigham City, Utah. South Ogden, Utah, to Bountiful, Utah. Salt Lake City, Utah, area to Murray, Utah, area. Draper, Utah, to American Fork, Utah. Moark Fork, Utah, to Jct. US 6 East in Utah. Provo, Utah, to Jct. Utah 75. Jct. US 160, Arizona, to southern terminus in Flagstaff, Arizona. 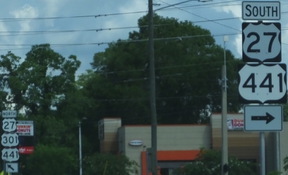 Multiplex with I-95 in Jacksonville, Florida. Multiplex with US 301 in Baldwin, Florida. Lake City, Florida, to Live Oak, Florida. Possibly some part of the Tallahassee, Florida, area. Possibly some part of the Pensacola, Florida, area. Alt. US 90 near Pensacola from US 29 to I-10. U.S.S. Alabama area in Mobile, Alabama. Gulfport, Mississippi, to Bay Saint Louis, Mississippi. New Orleans, Louisiana, area. Paradis, Louisiana, to Lafayette, Louisiana. Multiplex with I-10 in Lake Charles, Louisiana. Multiplex with I-10 near Louisiana/Texas border. Houston, Texas, area and along multiplex with I-10 West. Multiplex with I-10 in the San Antonio, Texas, area. Immediate area of western terminus in Van Horn, Texas. Logan, Utah, to southern terminus in Brigham City, Utah. Daytona Beach, Florida, area. DeLand, Florida, to Jct. Florida 417 near Sanford, Florida. Kissimmee, Florida, to Jct. US 17 South in Winter Haven, Florida. Multiplex with I-4 to Jct. Business US 41 and part of Dale Mabry near Tampa, Florida. Multiplex with I-90 near Missoula, Montana. Alt. US 93 multiplex with I-80 in Nevada. Jct. US 6/50 East in Majors Place, Nevada, to Jct. Nevada 168 in Coyote Springs. Jct. I-15 north of Las Vegas, Nevada, to Jct. I-40 east of Kingman, Arizona. 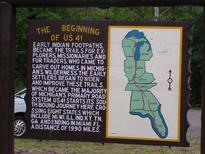 Never traveled as U.S. 94, but clinched as U.S. 41. Winnemucca, Nevada, to Hawthorne, Nevada. Alt. U.S. 95 from northern terminus along I-80 to Fernely, Nevada. Las Vegas, Nevada, to Erhenberg, Arizona. Multiplex with I-10 in Beaumont, Texas, to southern terminus (probably) in Port Arthur, Texas. Former/unsigned US 97 in Alaska. Multiplex with I-90 in Ellensburg, Washington. Multiplex with I-82 near Yakima, Washington. Madras, Oregon, to Diamond Lake Junction, Oregon. Jct. Florida's Turnpike in Royal Palm Beach, Florida, to Jct. Florida 80 West near Belle Glade, Florida. Okeechobee, Florida, area. Sebring, Florida, to Avon Park, Florida. Southeast of Zephyrhills, Florida. Multiplex with US 301 near Dade City, Florida. Frostproof, Florida, to near Lakeland, Florida. Multiplex with Florida 50. Northern terminus of Florida 589 to Destin, Florida. Fort Walton Beach, Florida, to Navarre, Florida. Pensacola, Florida, area. Spanish Fort, Alabama, area. U.S.S. Alabama area in Mobile, Alabama. Multiplex with I-59 near Hattiesburg, Mississippi. Seattle, Washington, area. Portland, Oregon, area (both 99E and 99W). Near Grants Pass, Oregon. Vina, California, to Yuba City, California. Likely some in southern California TBD. "Northern" terminus at Olympia, Washington, to Jct. Washington 104 East. Lake Quinault, Washington, to Astoria, Oregon. Newport, Oregon, to Jct. US 199 near Crescent City, California. Ukiah, California, to Salinas, California. San Luis Obispo, California, (most of if not all the way) to southern terminus in Los Angeles, California. Parts of Historic US 101 between Los Angeles and San Diego, California. 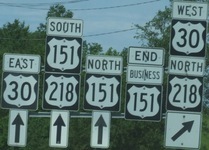 Former US 113 from Dover, Delaware, to Milford, Delaware. Possibly near Ocean City, Maryland and Snow Hill, Maryland. Multiplex with US 70 near Goldsboro, North Carolina. Probably some of former US 117 near Wilmington, North Carolina. I-40 Eastern terminus to US 76 in Wilmington, North Carolina. South of US 421 in Wilmington, North Carolina. Multiplexes with I-64 in West Virginia. Easley, North Carolina, to northern terminus in Greenville, South Carolina. Northern terminus in Grayling, Michigan, to Jct. I-96 near Lansing, Michigan. Jct. 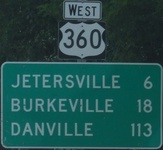 US 30 to downtown Van Wert, Ohio. Cincinnati, Ohio, and Covington, Kentucky, area. 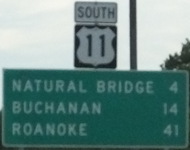 Robbinsville, North Carolina, to Ranger, North Carolina, except Murphy bypass. Multiplex with I-985 near Gainesville, Georgia. Athens, Georgia, to Macon, Georgia. Multiplex with US 41 near Jasper, Florida. Jct. I-10 to Jct. US 90 near Live Oak, Florida. Jct. CR 545 in Bordentown, New Jersey, to I-295 Exit 57 in New Jersey. Jct. I-295 Exit 23 in New Jersey, to Jct. US 322 in New Jersey. Northern terminus in Petosky, Michigan, to Jct. M-32 near Elmira, Michigan. Alba, Michigan, to just north of Kalkaska, Michigan. Hamilton, Illinois, to Alexandria, Missouri. Jct. I-43 to Jct. US 41 South in Green Bay, Wisconsin. Multiplex with I-64 near the Ohio River bridge between Kentucky and Indiana. Shoals, Indiana, to Vincennes, Indiana. Terre Haute, Indiana, area. Champaign, Illinois, area. Peoria, Illinois, area. Galesburg, Illinois, area. Madison, Wisconsin, to Dubuque, Iowa. Cascade, Iowa, to Marion, Iowa. Multiplex with US 30 on the south side of Cedar Rapids, Iowa. Most of Business US 151 in Cedar Rapids and Marion, Iowa. Eastern terminus at Whalebone Junction, North Carolina, to Jct. US 17 North near South Mills, North Carolina. Near I-95 in northern North Carolina. Near I-85 in northern North Carolina. Multiplex with US 501 in Roxboro, North Carolina. Mutiplex with I-25 in Colorado. Fort Garland, Colorado, to Cortez, Colorado. Jct. Colorado 141 to Teec Nos Pos, Arizona. Kayenta, Arizona, to western terminus near Tuba City, Arizona. Multiplexes with I-40 and I-30 in Little Rock, Arkansas, area. Multiplex with I-49 in Louisiana. Multiplex with US 90 in Lafayette, Louisiana. Grand Rapids, Minnesota, to Aitkin, Minnesota. Garrison, Minnesota, to Maple Grove, Minnesota. Jct. Minnesota 55 in Plymouth, Minnesota, to Jct. Minnesota 60 West near Mankato, Minnesota. Multiplex with US 34 in Iowa. Jct. Business I-29 North to Jct. US 36 in St. Joseph, Missouri. 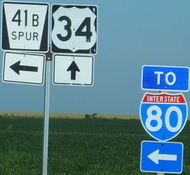 Multiplex with I-70 in Missouri and Kansas. Multiplex with I-435 in Kansas. Northernmost couple of miles in Dallas. South Carolina 210 to I-95 near Wells, South Carolina. 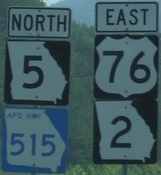 Northern terminus at US 64 in North Carolina to Pickens, South Carolina. Anderson, South Carolina, area. I-95 to US 15 near Harleyville, South Carolina. Carlsbad, New Mexico, to St. Johns, Arizona. Petrified Forest NP, Arizona, to western terminus in Arizona. Oklaunion, Texas, to Vernon, Texas. 7th St to Texas 71 in the Austin, Texas, area. Jackson, Wyoming, area? Hidden US 189 from Jct. I-84 in Utah, to Heber City, Utah, then signed route to southern terminus in Provo, Utah. Opelousas, Louisiana, area. Multiplex with I-45 in Texas. Multiplex with I-35 in Texas. Multiplex with I-90 in Montana. West Yellowstone, Montana, to Rock Springs, Wyoming. Jct. US 6 West near Heiner, Utah, to Jct. US 163 in Bluff, Utah. Multiplex with I-40 in Arizona, to Alpine, Arizona. Multiplex with I-10 in Arizona. Melbourne, Florida, to Jct. I-95, Florida. St. Cloud, Florida, to Walt Disney World, Florida. Augusta, Maine, area. Topsham, Maine, to southern terminus in Brunswick, Maine. Eastern terminus in Bangor, Maine, through multiplex with I-395 in Bangor, Maine. Augusta, Maine, area. Gray, Maine, area. Multiplex with US 4 in New Hampshire. Multiplex with New Hampshire 9 from I-89 to Hillsborough. Multiplex with New Hampshire 101 in Peterborough to Rindge, New Hampshire. Multiplex with Massachusetts 2 to southern end of multiplex with US 44 in Connecticut. Short segment in Litchfield, Connecticut. Multiplex with I-84 and US 7 in Connecticut. Peekskill to Stony Point, New York. Ramapo, New Jersey, to Jct. Hamburg Turnpike in Wayne, New Jersey. Jct. New Jersey 10 near Morris Plains, New Jersey, to Bernardsville, New Jersey. Possibly other short stretches near I-287 in New Jersey. Jct. I-287 Exit 22, New Jersey, to Doylestown, Pennsylvania. Valley Forge, Pennsylvania, to multiplex with I-95 in Delaware. 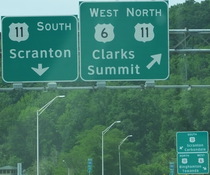 Northern terminus in Pennsylvania to concurrency with I-80 near Netcong, New Jersey. Jct. I-287 Exit 22, New Jersey, to Jct. I-295 in Lawrenceville, New Jersey. Near Jct. NJTP in Mansfield, New Jersey. Northern terminus near Kingston, New York, to Jct. I-476. Jct. I-81 to Jct. Pennsylvania 325 in Tower City. Passed eastern terminus on US 169 in Minnesota. Multiplex with I-90 in Montana to western terminus at Yellowstone NP. Northern terminus at I-35 in Minnesota to Jct. US 20 West near Waterloo, Iowa. Jct. I-380 near Cedar Rapids, Iowa, to Jct. US 34 in Mount Pleasant, Iowa. Multiplex with US 61 north of Keokuk, Iowa. Passed southern terminus in Keokuk, Iowa. Multiplex with I-90 in New York. Multiplex with I-86 in New York. Multiplex with I-68 in Maryland. 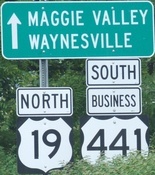 Former northern terminus in Waverly, New York, to Sayre, Pennsylvania. Pennsdale, Pennsylvania, to Jct. I-68 in Maryland. Covington, Virginia, and multiplex with I-64 in western Virginia. Near Exit 150 off I-81 in Virginia. Multiplex with I-81 to Jct. I-73 (as of 2018) north of Greensboro, North Carolina. 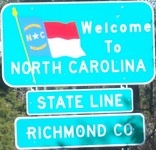 Greensboro, North Carolina, area, to southern terminus at US 1 in Rockingham, North Carolina. Lynchburg, Virginia, area. Bedford, Virginia, to Roanoke, Virginia. Boone, North Carolina, to Blowing Rock, North Carolina. Linville Falls, North Carolina. Jct. US 74 in North Carolina to Jct. I-85 in South Carolina. Multiplex with US 1 Wrens, Georgia, to Louisville, Georgia. Multiplex with US 23 in southern Michigan and Sylvania, Ohio. Multiplex with I-76 from Akron, Ohio, to I-71. Multiplex with US 30 near Van Wert, Ohio. Rensselaer, Indiana, area. Multiplex with US 50 and US 150 in Loogootee, Indiana. Multiplex with US 60 around Owensboro, Kentucky. Huntsville, Alabama, area. Montgomery, Alabama, to Dothan, Alabama. 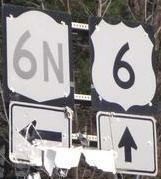 Northern terminus at US 6 to Jct. Ohio 2 near Sandusky, Ohio. Short Pump, Virginia, area. Charlottesville, Virginia, area. Multiplex with I-70 near Wheeling, West Virginia. Multiplex with US 64 near Tarboro, North Carolina. Jct US 70 near Kinston, North Carolina, to Jct. NC 24 East near Jacksonville, North Carolina. Multiplex with I-20 in Texas. Multiplex with Texas 49 near Daingerfield. Whalebone Jct., North Carolina, to Manns Harbor, North Carolina. (no longer part of US 264?) Alternate US 264 from Airport Blvd. to I-95 in Wilson. Jct. I-795 near Wilson, North Carolina, to Jct. I-540 east of Raleigh, North Carolina. Near I-40 exit in Checotah, Oklahoma. Rockport, Arkansas, to Hot Springs, Arkansas. Multiplex with I-40 near Oklahoma City, Oklahoma. Hugo, Oklahoma, to Mt. Pleasant, Texas. Fremont, Nebraska, to Hamburg, Iowa. Multiplex with US 64 near Pisgah Forest, North Carolina. Multiplex with US 25 in Travelers Rest, South Carolina. Jct. I-385 to Jct. SC 291 in Greenville, South Carolina. Multiplex with I-44 near Lawton, Oklahoma. Multiplex with I-44 through multiplex with US 287 in Wichita Falls, Texas. Hardeeville, South Carolina, to Ridgeland, South Carolina. Multiplex with US 301 near Allendale, South Carolina. Augusta, Georgia, area. Atlanta, Georgia, area? Near Greenville, Mississippi, to Chicot, Arkansas. First hundred feet or so near eastern terminus at US 80. Richland, Georgia, to Jct. US 80 East in Phenix City, Alabama. Jct. US 31 South in Birmingham, Alabama, to western terminus at I-20/I-59. Multiplex with I-94 in Jamestown, North Dakota? Multiplexes with I-44 in Oklahoma. Multiplex with I-44 in southern Oklahoma, to Jacksboro, Texas. Jct. US 290 East to Jct. I-37 South in the San Antonio, Texas, area. Multiplex with I-37 south of San Antonio, Texas. Multiplex with I-69C's southernmost mile or so in Pharr, Texas. Northern terminus in Denver, Colorado, to Jct. C-470 near Morrison, Colorado. Multiplex with US 50 in Poncha Springs, Colorado. Monte Vista, Colorado, to Tres Piedres, New Mexico. LaChuachia, New Mexico, to Jct. I-25 North near Santa Fe, New Mexico. Clines Corners, New Mexico, to Carlsbad, New Mexico. Fort Stockton, Texas. West Yellowstone, Montana, to Jct. US 26 East in Wyoming. Laramie, Wyoming, to Broomfield, Colorado. I-70 to Speer Ave. in Denver, Colorado. Jct. US 40 West in Denver, Colorado to Limon, Colorado. Multiplex with US 50 near Lamar, Colorado. Amarillo, Texas, to Fort Worth, Texas. Parts of Business US 287 in Wichita Falls, Texas. Business US 287 from Jct. US 287 north of Saginaw, Texas, to Jct. I-820 in Fort Worth, Texas. Multiplex with I-820 and I-20 in Texas. Multiplex with I-45 in Texas. Beaumont, Texas, to Port Arthur, Texas. Jct. Texas 360 to Jct. US 281 South. Last few miles before western terminus at I-10 in Texas. (Former alignment in Delaware.) Jct. new Toll bypass in Delaware to Jct. I-295, Virginia. SR 620 to Virginia 144 in Colonial Heights, Virginia. Jct. 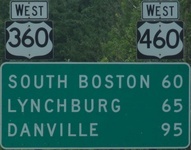 US 460 in Petersburg, Virginia, to Stony Creek, Virginia. Emporia, Virginia, to Jct. I-95 Exit 8 in Virginia. Benson, North Carolina, to Godwin, North Carolina. Multiplex with Business Loop I-95 in Fayetteville, North Carolina. Multiplex with I-95 in North Carolina to Jct. US 76 East in Florence, South Carolina. Sardinia, South Carolina, to Jct. I-95 south of Manning, South Carolina. Multiplex with I-95 near Santee, South Carolina, to Thontosassa, Florida, including Statesboro, GA, bypass. Jct. I-4 in Tampa, Florida, to Sarasota, Florida. Clinched in (Delaware, formerly), Maryland, Georgia. Eastern terminus? in Portland, Maine to Conway, New Hampshire. Bartlett, New Hampshire, to Twin Mountain, New Hampshire. Jct. New Hampshire 112 to Jct. I-91 near Wells Bridge, Vermont. 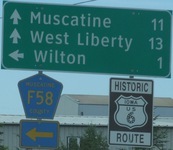 Passed western terminus on US 2. 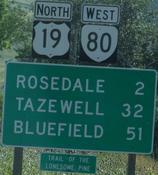 Laurel, Montana, to Rockvale, Montana. Multiplex with Alt. US 14 near Lovell, Wyoming. Multiplex with US 14/16/20 in Greybull, Wyoming. Multiplex with I-40 near Winston-Salem, North Carolina. Thomasville, Georgia, area. Multiplex with US 98 near Medart, Florida. Multiplex with US 98 from Lanark, Village, Florida, to southern terminus in Apalachicola, Florida. Pigeon Forge, Tennessee, to Gatlinburg, Tennessee. Sugar Grove, North Carolina, to Blowing Rock, North Carolina. Hickory, North Carolina, to I-85 in Gastonia, North Carolina. Multiplex with US 301 near Ulmer, South Carolina. Jct. Garden State Parkway in New Jersey to Jct. US 40 West in New Jersey. Logan, New Jersey, to Chester, Pennsylvania. Multiplex with US 202 near West Chester, Pennsylvania, to multiplex with US 1 near Painters Crossroads, Pennsylvania. Near Hershey and Hummelstown, Pennsylvania. Multiplex with I-83 and I-81 near Harrisburg to Jct. Pennsylvania 225. State College, Pennsylvania, to Port Matilda, Pennsylvania. Franklin, Pennsylvania. Frederick, Maryland, to White Post, Virginia. 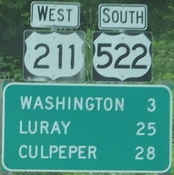 Concurrency with US 211 in Virginia. 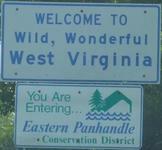 Clinched in Maryland, West Virginia. Near I-95 in Brunswick, Georgia. Jct. Virginia 288 near Richmond, Virginia, to South Boston, Virginia. Multiplex with I-30 and I-35W in Fort Worth, Texas. Decatur, Texas, to Jacksboro, Texas. Multiplex with US 84 in Texas. Carrizozo, New Mexico, to western terminus in San Antonio, New Mexico. Northern terminus in Lead, South Dakota, to Wind Cave National Park, South Dakota. Granada, Colorado, to Lamar, Colorado. Multiplex with I-10 near Fort Stockton, Texas. Multiplex with I-90 in Washington. Multiplex with I-82 in Washington and Oregon. Multiplex with I-84 in Oregon. Jct. California 70 near the Nevada border to Jct. California 167 near Lee Vining. Wichita, Kansas, to western terminus in Granada, Colorado. Raleigh, North Carolina, area. Multiplex with US 52 from Society Hill, South Carolina, to Darlington, South Carolina. Sumter, South Carolina, area. Cartersville, Georgia, to Gadsden, Alabama. Multiplex with I-40 in Tennessee. Multiplex with I-44 in Tulsa, Oklahoma. Multiplex with I-465 in Indianapolis, Indiana. Multiplex with I-74 in Indiana. Multiplex with US 50 near Versailles, Indiana. Lexington, Kentucky, area. Multiplex with I-75 in Kentucky. Multiplex with US11/19 in Virginia. Bristol, Tennessee, to Boone, North Carolina. Cycle, North Carolina, to Jct. I-77 in North Carolina. Multiplex with I-40 near Greensboro, North Carolina. 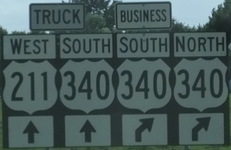 US 301 to I-95 in Dunn, North Carolina. Jct. I-140 to Jct. US 117 in Wilmington, North Carolina. Eastern terminus to Jct. Pennsylvania 23 in Valley Forge, Pennsylvania. Multiplex with US 222 in Reading, Pennsylvania. Hershey, Pennsylvania, area? Cleveland, Ohio, area. Eastern terminus at Natchez, Mississippi, to Vidalia, Louisiana. Nashville, Tennessee, area. Huntsville, Alabama, area? Jct. US 80 East to Jct US 280 East in Phenix City, Alabama. Multiplex with US 82 in Eufaula, Alabama. Dothan, Alabama, area. Fountain City, Tennessee, area. Knoxville, Tennessee, area. Sevierville, Tennessee, to Cherokee, North Carolina. Orlando, Georgia, to Cornelia, Georgia. Commerce, Georgia, to Warfield, Georgia, except for the bypass of Madison. Lake City, Florida, to I-75 Exit 414, Florida. Gainesville, Florida, to Leesburg, Florida. Kissimmee, Florida, to St. Cloud, Florida. Okeechobee, Florida, area. Jct. US 98 East near Royal Palm Beach, Florida, to Jct. Florida 80 West near Belle Glade, Florida. Miami, Florida, area. Portsmouth, Virginia, area. 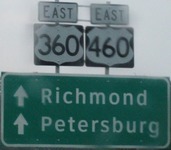 From I-295 to US 301 on Business US 460 in Virginia. Multiplex with I-85 near Petersburg, Virginia. Western part of Business US 460 in Blackstone, Virginia. 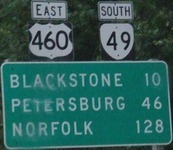 Blackstone, Virginia, to Farmville, Virginia. Appomattox, Virginia, (probably except near Roanoke) to Claypool Hill, Virginia. Northern terminus in Monticello, Utah, to Cortez, Colorado. Shiprock, New Mexico, to Gallup, New Mexico. Lynchburg, Virginia, area. South Boston, Virginia, to Sanford, North Carolina. Southern Pines, North Carolina, to Latta, South Carolina. Myrtle Beach, South Carolina, area. Sumter, South Carolina, to Jct. I-95 near Manning, South Carolina. Multiplex with US 301 in Manning, South Carolina. 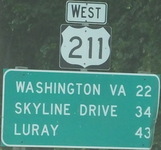 Concurrency with US 211 in Virginia. Culpeper, Virginia, to Cuckoo, Virginia. Durango Mountain Resort entrance, Colorado, to southern terminus in Bernalillo, New Mexico. Multiplex with I-85 in North Carolina. Near I-26 in South Carolina. 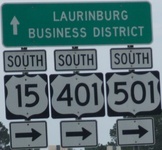 Orangeburg, South Carolina, to Bamberg, South Carolina.